Through diplomacy under King Stone Hand Jaguar, the Snakes assembled the forces needed to challenge their rivals at Tikal. Finally, in 562, under King Sky Witness, they defeated them. 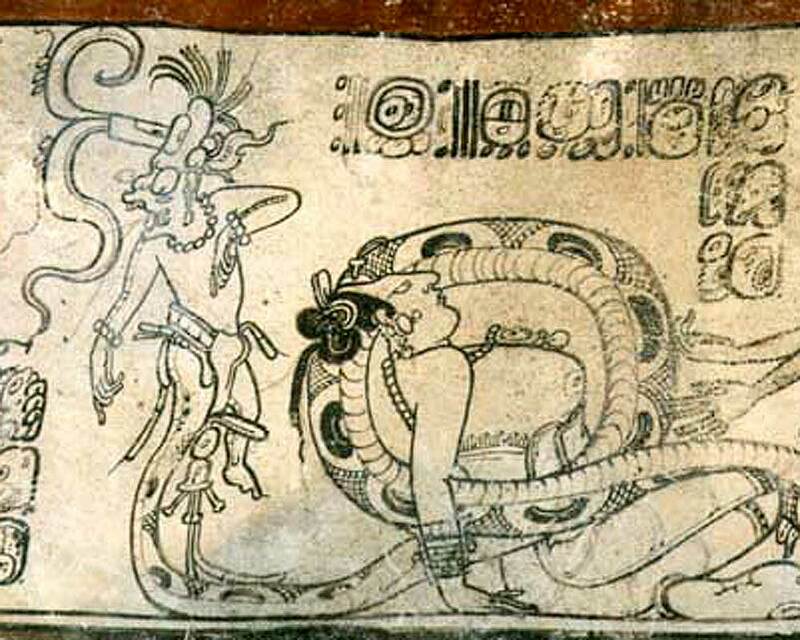 Later, King Scroll Serpent also defeated Palenque. Sky Witness seems to have died in 572, and Scroll Serpent began his rule in 579. Not much is known about the Snake ruler during the intervening six or seven years, who was named First Axewielder (Yax Yopaat), but the inscription on this mirror back tells us he was the owner’s father. Mirrors served as objects of magic and mysticism. The God of royalty, God “K”, wears as his symbol, a mirror in his forehead, flashing light in the form of a flare or torch. In representations of palace scenes, it is only the ruler who is shown looking into a mirror…. Shamans performed their magic using the shining depths of pyrite and obsidian. The “dark” mirrors of obsidian and the “bright” mirrors made of pyrite reflected the worlds in which gods and humans lived. K’awil, also known as God K, the Manikin Scepter, and the Flare God … is distinguished by having a cigar, a torch holder, or an axe blade penetrating a mirror in his forehead. His face has zoomorphic features, but his body is often shown as an infantile human with one leg transformed into a serpent. God K (K’awiil), shown with his serpent leg intertwining a naked woman. Ceramic. Classic period. K’awiil’s image was incorporated into scepters (called Mannikin Scepters) that were used in royal accession rituals and as symbols of authority — there is a good discussion at the Metropolitan Museum website. The name of the Aztec god Tezcatlipoca, one of their primary deities, is often translated as “smoking mirror,” and the two gods might have evolved from a common ancestor. Why would such a god have a mirror on his forehead? 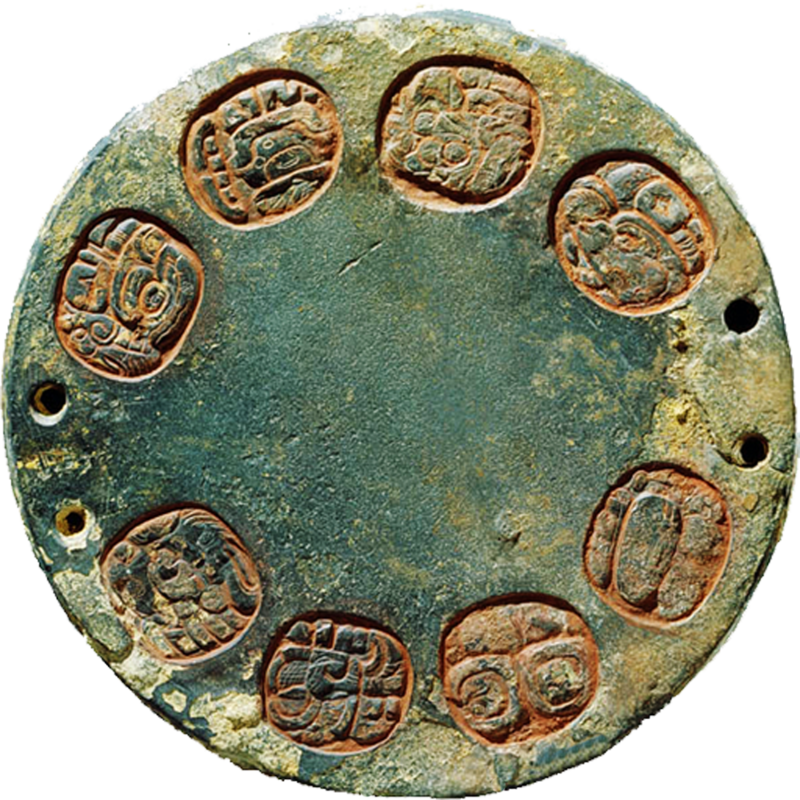 We know that mirrors in Mesoamerica were objects of divination, or “scrying,” similar to the familiar crystal balls used in the West. Mirrors were still being used in this manner at the time of the Conquest. Mirrors seemed to allow viewers to witness, but not directly interact with, a different dimension or realm from that of ordinary human existence. Consequently, they were objects of great value and power.